The Albright-Knox Art Gallery released its latest schematic designs in the AK360 expansion project, revealing a new direction from the previous controversial design concept. The new plan, which was developed in coordination with local, state, and national preservationists, was approved unanimously on Monday night by the Buffalo Fine Arts Academy, the board that oversees the gallery, according to Buffalo News. Under the new iteration of the AK360 Campus Development and Expansion plan developed by OMA and firm partner Shohei Shigematsu, a freestanding building will be added to the north side of the historic campus that houses the gallery in Buffalo, New York. The new building adds 29,000 square feet of space for displaying special exhibitions and the museum’s permanent collection, allowing the number of artworks that can be displayed to increase dramatically. The extension is also planned to have a double-height wraparound promenade as well as a translucent facade to connect the interior of the building to the site, a Frederick Law Olmsted-designed landscape. 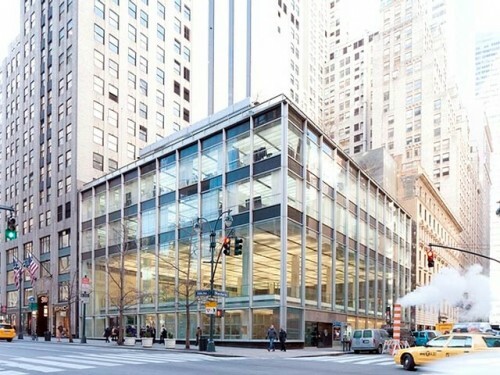 This ensures the preservation of the existing Gordon Bunshaft building built in 1962, which was an addition to the original Beaux-Arts museum that was built in 1905. OMA still plans to add improvements to the 1962 building taken from the first design concept. Changes include adding a new education wing in the lower level, transforming the surface level parking lot into a green landscape, and adding a new point of entry into the east façade. The open-air courtyard in the 1962 building will be covered to serve as an “indoor town square” and open the space up for year-round activities. A “scenic bridge” will connect the new north building to the original 1905 building, weaving through the Olmsted Park. Previous expansion plans included drastically transforming the Bunshaft building, rattling preservationists and igniting controversy. OMA/Shohei Shigematsu was first chosen as the lead designer for the expansion in June 2016 and released their first design concept in 2017, which proposed building two architectural volumes—one that would hover above the sculpture garden of the Bunshaft building and one that would be constructed underground along the original gallery. Opposition to that plan halted it from moving forward, until now. Fundraising for the project is almost complete—approximately $125 million is raised for the $155 million project. More refined plans for the expansion will emerge over the next months during the design development phase, which is expected to continue into 2019. Construction is aimed for fall 2019 with an expected opening in 2021. The renovation of the Hirshhorn Museum and Sculpture Garden in Washington, D.C. by Japanese artist Hiroshi Sugimoto has been completed only two months after renderings were first revealed for the project. 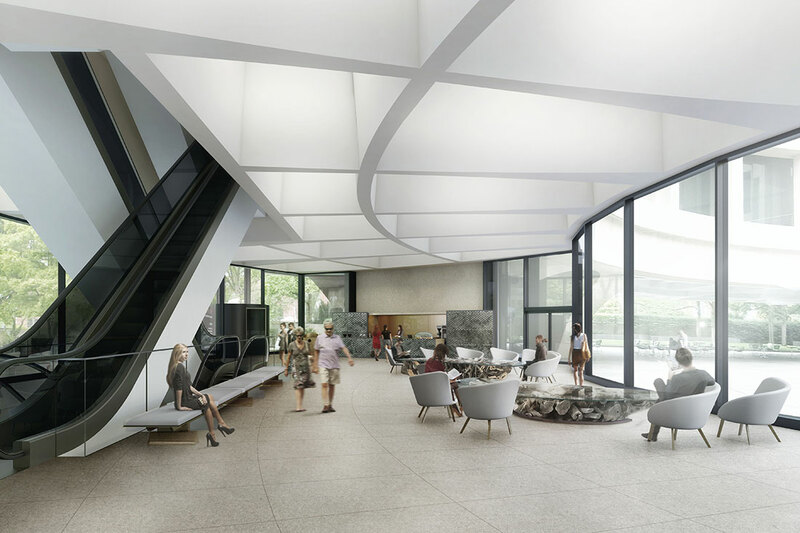 The lobby’s light new look not only pays homage to the curved Gordon Bunshaft-designed museum housing it but will also introduce a serpentine café when it opens to the public on February 23. Sugimoto and his Tokyo-based architectural firm, New Material Research Laboratory (NMRL), drew inspiration from the clash between the uneven swirls of the natural world and the mathematically perfect (and unnatural) roundness of the Hirshhorn. As previously reported, Sugimoto had discussed transplanting the roots of a 700-year-old Japanese nutmeg tree into the lobby, and he made good on his promise by turning the root bundle into a twin set of glass-topped tables. The effect is quite striking, as the chaotic branches have been trimmed down, cut in half, and trapped under a sheet of manmade material. “Looking deeper into the roots, I became equally delighted by the randomness of the lines, drawn by nature. There are no perfectly round circles or perfectly straight lines,” said Sugimoto in a statement. “I found it fitting to place one of nature’s circles inside this manufactured one so that we might compare the two: notional shapes and natural shapes.” The lobby’s white chairs also reference natural spirals in their design, with their backs twisting as they rise, resembling the helical curve of DNA strands. Brushed brass benches with legs made of optical glass blocks, referencing Sugimoto’s storied photography career, have been installed throughout the space. The largest change to the lobby has been the removal of a dark film over the 3,300 square feet of curvilinear windows, which has allowed natural light to flood the space, and the installation of Your oceanic feeling (2015), a swirling light sculpture by Icelandic artist Olafur Eliasson that hangs from the ceiling. While the Hirshhorn had held a special preview event of the space last week, the lobby will officially open to the public on February 23, 2018. Visitors will be able to check out the new Dolcezza Coffee & Gelato café, a 20-foot long coffee bar clad in diamond-shaped tin and brushed-brass plates that resembles serpent scales. Guests can also view a video preview of Krzysztof Wodiczko’s Hirshhorn Museum, Washington, DC, 1988–2000 before the projection is once again displayed on the museum’s exterior. Artist and photographer Hiroshi Sugimoto has been selected to redesign the lobby of the Hirshhorn Museum and Sculpture Garden in Washington, D.C., the first time the space has been touched in the museum’s 42-year history. The Tokyo-born artist, along with his Tokyo-based architectural firm, New Material Research Laboratory (NMRL), will be responsible for not only designing sculptures and furniture for the lobby of the Gordon Bunshaft-designed museum, but the new café in the lobby’s east end as well. Seeking to reference the round form of the Hishhorn building, Sugimoto drew inspiration for the furnishings from the roots of a 700-year old Japanese nutmeg tree. The imagery of twisted, chaotic roots will be reflected in the lobby’s central group table, and the spiraling chairs surrounding it. "I became fascinated by the roots of an enormous tree, which fanned out to form a large circle, and I decided that this was the circle I would install in the Hirshhorn lobby - a symbol of life," said Sugimoto. "All art takes its inspiration from the power inherent in nature, and my hope is that as visitors enter the museum, they will experience the balance of the man-made and natural circles." 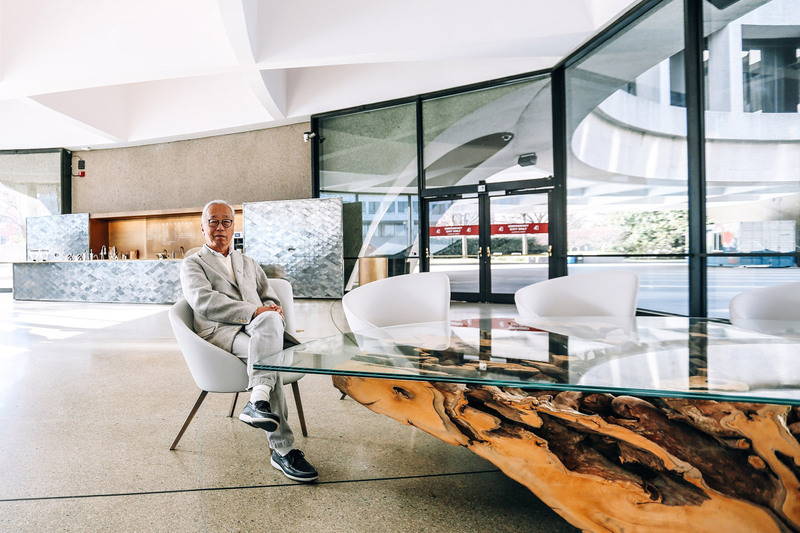 Sugimoto will be leaving Bunshaft’s original terrazzo floors, deeply coffered ceiling and exposed aggregate walls, but the artist removed the dark film that covers the lobby’s 3,300-square feet of windows, and opened the space up to views of the National Mall. The rotunda will also see new signage and welcome desks, in addition to the installation of Your oceanic feeling (2015), a swirling light sculpture by Icelandic artist Olafur Eliasson. The lobby’s renovation will coincide with the opening of Dolcezza Coffee & Gelato at Hirshhorn, and Sugimoto has designed a 20-foot long, serpentine coffee bar plated in diamond-shape brass and tin plates. The Hirshhorn and Sugimoto have a long history together, as in 2006 the museum was the first institution to present a career survey of Sugimoto’s work. The new lobby, and Dolcezza, will formally open to the public in February 2018. This week Dallas is celebrating its newest landmark, a goodie but not an oldie. The Landmark Commission voted on Monday to designate One Main Place, designed by SOM's Gordon Bunshaft, as the city's newest landmark. Beyond its waffled exterior, the 48-year-old International Style tower houses 19 floors of offices and a Westin Hotel spread out over its 33 stories. 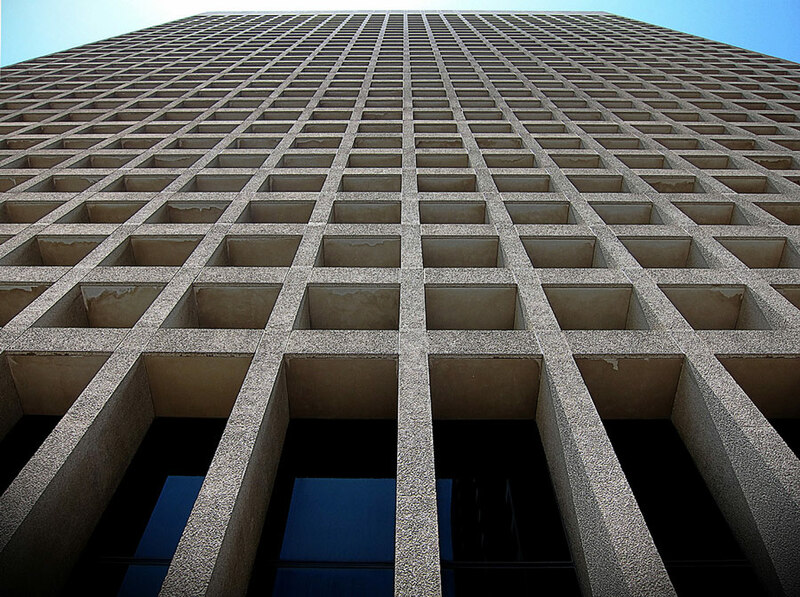 Usually, buildings have to be at least 50 years old to be considered for landmarking, but officials made an exception for its high quality design and its singular place in Dallas's history. The New Orleans–based owners sought the designation for one particular reason: historic preservation tax credits. The gridded concrete and granite building, though, is already listed on the National Register of Historic Places. According to its designation report, One Main Place was supposed to be part of a three-phase redevelopment of downtown Dallas that was proposed in the 1960s. That superblock scheme, which would have replaced downtown with Corbusian Cities of Tomorrow, was never realized in full. According to the Dallas Morning News, one preservation expert told the Landmark Commission that Bunshaft's building, like Dallas' pedestrian tunnels, merited protection because it reflects a specific approach to planning that prevailed in the city through the 1980s. One Main Place is "the center and genesis of the tunnel system," said Jay Firsching, a senior historic preservation specialist at Architexas. That system was proposed by Vincent Ponte, the Montreal urban planner behind his city's famous tunnels that keep pedestrians out of the cold during long Quebec winters. To become official, though, the landmark still needs the Plan Commission and City Council's approvals. Back east, Bunshaft's SOM designs are getting recognition by another landmarks commission: In 2015, New York City's Landmarks Preservation Commission added 28 Liberty, an office tower and plaza in Manhattan's Financial District, to its roster of protected modernist buildings. Here's another reason to get your Metro North tickets to New Haven this fall: In addition to the colorful foliage, gothic Yale University campus, and various modernist gems such as Paul Rudolph's School of Architecture and Louis Kahn's Center for British Art, The Beinecke Rare Book & Manuscript Library will reopen its iconic building on Tuesday, September 6, following a 16-month renovation led by Hammond Beeby Rupert Ainge Architects working with Newman Architects of New Haven. Completed in 1963, Beinecke is considered Gordon Bunshaft's masterpiece. Its exterior grid of granite and Vermont marble panels are one of the most recognizable designs of that era, and remain both inspiring and inimitable. The renovations restored the architectural landmark to its illuminated glory by refurbishing the six-story glass stack tower, preserving the sculpture garden by Isamu Noguchi, upgrading the library’s climate-control system, and expanding classroom space. “We are excited to welcome back researchers and visitors to the library—an architectural masterpiece that has been adapted to meet challenges created by an ever expanding collection, changing technology, and the evolving nature of the library’s mission,” Beinecke Library Director Edwin “E.C.” Schroeder said. 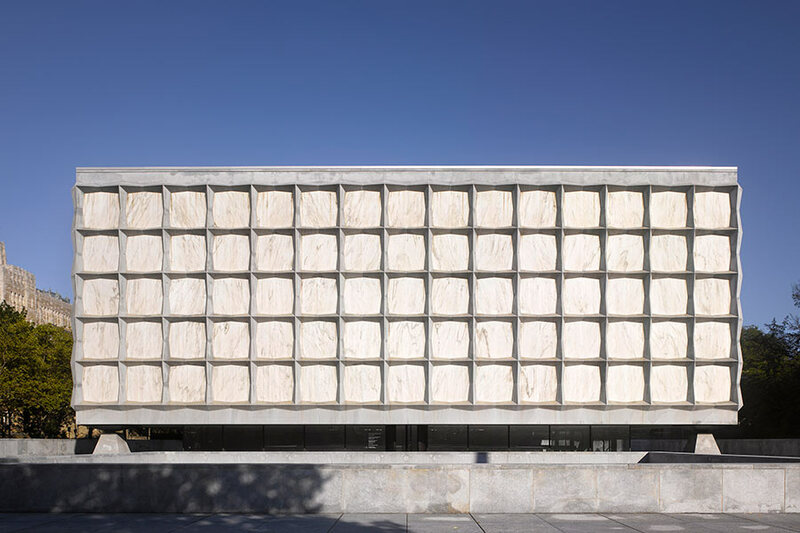 “The renovation ensures that the Beinecke Library will remain a world-class center for teaching, research, and scholarship for decades to come.” New classrooms will allow students to study the physical structures of books and experiment with inks, papermaking, and printing. The advanced fire suppression system was upgraded, which includes the famous ability to drop the rare books and manuscripts 6 stories into the ground in the case of fire. In May 2015, in preparation for the project, five miles worth of collection material—the equivalent of about 255,000 books—was relocated to the Yale University Library Shelving Facility. The rare books in the collection includes Yale’s copy of the Gutenberg Bible—one of 21 complete copies of the first book printed in moveable type still in existence. On display in the exhibition space will be John Audubon’s “Birds of America." Two exhibitions will mark the reopening. One will showcase recent acquisitions to the library’s collections, including Medieval manuscripts, early and contemporary photography, and the papers of celebrated writers. Items on display will include photographs of Abraham Lincoln from the Meserve-Kunhardt Collection of 19th century American photography, a collection of letters from James Baldwin, additions to the Ezra Pound papers, and selections from archives of playwright Paula Vogel, and writer David Rakoff. The second exhibition, “Destined to be Known: The James Weldon Johnson Memorial Collection at 75,” celebrates the 75th anniversary of Yale’s collection of African American arts and literature named for civil rights advocate and renowned man of letters James Weldon Johnson. Founded in 1941 by Carl Van Vechten, the collection contains the papers, works, and memorabilia of African American writers and artists from the 18th century through modern times. It features the archives of Langston Hughes, Richard Wright, and Zora Neale Hurston, among other luminaries. The library will host an open house for the public on Saturday, October 8 from 10 a.m. to 4 p.m.
"Sometimes the best way to restore a historic structure is to reuse it." The comment came from Landmarks Preservation Commissioner Robert Tierney at the conclusion of Tuesday's landmarks hearing on revisions proposed by Vornado Realty for interiors of the recently landmarked Manufacturers Trust Building on Fifth Avenue. The statement summed up the mood of the commission with regard to changes in the space, originally designed by Gordon Bunschaft, which include dividing the first floor to make space for two retail tenants. Most of the commission picked apart the specifics while maintaining that the architects from SOM overseeing the renovation were generally on the right track. 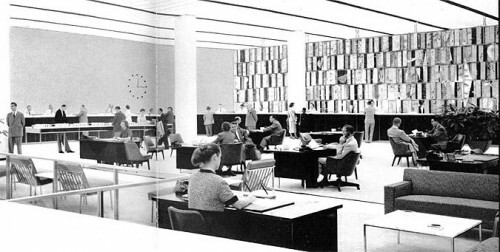 The crisp, well-paced presentation from SOM's Frank Mahan delved into several controversial changes, including destroying all of the black granite wall and interiors that sit behind the Henry Dreyfuss-designed safe door, shifting the escalators from north-south to east-west orientation, and losing the 43rd Street entrance, which would be replaced with two entrances on Fifth. The removal of the granite wall allows for the construction of a partition wall that will separate the space into two retail units. The partition wall will run east to west the length of the 9000-square foot space, dividing it into a 4000-square foot southern section, where the safe and granite wall once stood, and a 5000-square foot space in the northeast corner of the building. Only eleven feet tall, the partition wall is topped by seven-foot high glass panels that stretch to the ceiling. The famous paneled ceiling and its fluorescent glow spans most of the ground floor space and now will continue on through the area once occupied by the safe. In addition to moving the escalators, the retailer proposes to crisscross them. Instead of a twin sculptural mass (the double escalators were once clad in perforated bronze) two new glass-clad escalators split the traffic to go in different directions. From 43rd Street the profile will form a large "X" shape. No one on the commission responded favorably to the configuration and, needless to say, the preservationists didn't go for it either. One aspect that Meredith Kane, representing Vornado, said would not be negotiable was the positioning of the doors, stating that the new retail use necessitated a Fifth Avenue entrance. "The entrance on the side was sort of a discrete hiding of wealth, which is not appropriate for retail," she said, implying that without shifting the entrances, finding tenants would be difficult and put the project in jeopardy. "Without entrances on Fifth Avenue we won't be able to do any of the other [restoration] work," said Kane. The Canadian fashion retailer Joe Fresh will take the larger retail space at street level plus the entire 9000 square feet above. The smaller space does not have a tenant yet. The SOM proposal also includes a new screen inspired by the Bertoia screen that was removed by the building's former owner, Chase, when they vacated the building. A new screen made of anodized aluminum references its predecessor but cleans up its organic qualities with sharper lines and flat panels. Still, the proposed efforts to restore and revamp the space did not satisfy everyone. "Adaptive reuse is not a one way street. In some cases the user needs to adapt to the character of the landmark," said Christabel Gough, secretary for the Society for the Architecture of the City. "Moving the escalators and demolishing the vault would be equivalent, because of the [building's] transparency, to demolishing the Fifth Avenue facade of a traditionally composed building." 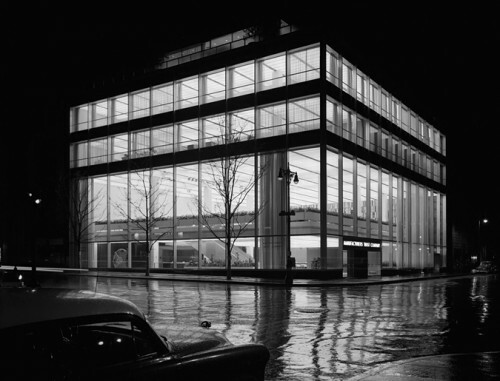 The Landmarks Preservation Commission has put the Gordon Bunshaft-designed Manufacturers Hanover Trust Company Building onto its Public Meeting/Public Hearing agenda for tomorrow morning at 9:30AM. Up for discussion will be the building’s first and second floor interiors, including the entrance lobby, escalators, teller counters, and floor and ceiling surfaces. The iconic vault designed by Henry Dreyfuss, which is visible from Fifth Avenue, and Harry Bertoia’s multifaceted metallic screen both made it on to the agenda. But according to Theodore Grunewald of the Coalition to Save MHT, the Bertoia has already been removed by Chase Bank, the sculpture's owner. 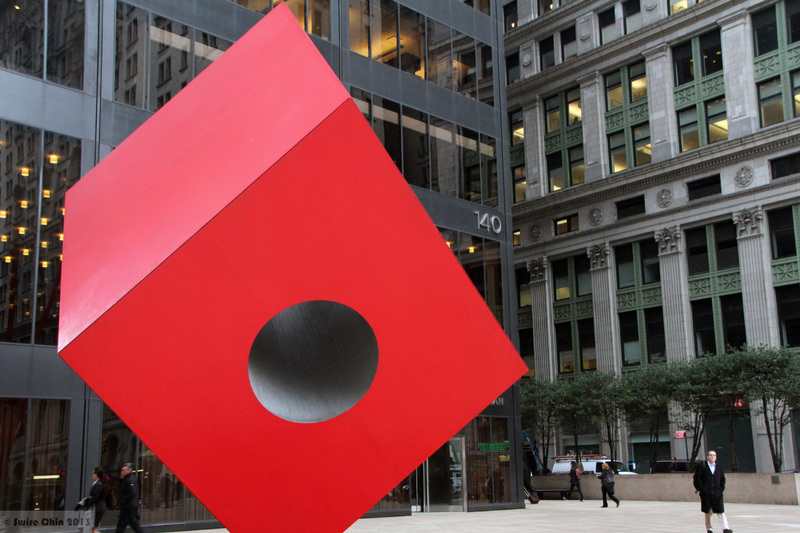 "Chase still has the sculpture, but they have not said where it is,” said Grunewald. AN’s Jennifer K. Gorsche joined a chorus of alarmed bloggers back in October and turned up renderings of a proposal for a teen clothing store, Forever 21. “It’s more than world class building, it’s a world monument,” said Grunewald. “People come from all over the world to see this building.” The building also happens to be the subject of several Ezra Stoller photos, two of which shown here, are now on view at the Yossi Millo Gallery through February 12. The gallery is closed on Mondays, but if you need a Stoller-fix stat, there will be lecture tonight on Stoller at the Center for Architecture called Mid-Century Modernism: as seen through the master's lens. Architectural historian Kenneth Frampton will be joined by John Morris Dixon, Brook Mason, and Erica Stoller.